This post is filed under Bar, Chex, Chex Cereal, Chocolate, Dry, Pretzels. I don’t know how that tastes, but it’s the most disgusting-looking thing I’ve seen in ages. If I saw that on the sidewalk I’d use a plastic bag to clean it up. I think you were being very kind (and generous) in your ratings. 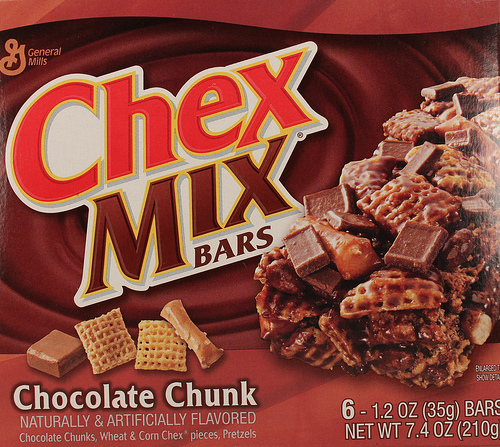 If I bought those bars based on the picture from the box then opened the package to find ‘that’, I’d think I’d been the victim of a very disgruntled Chex Mix worker. I don’t think your “looks” review is entirely accurate, as I can certainly see the chocolate bits on the real deal. They, just as the bar, are not shaped as shown on the package, but I can definitely see them there. Thank God looks aren’t everything. It tastes pretty good but I thought it would taste more salty. 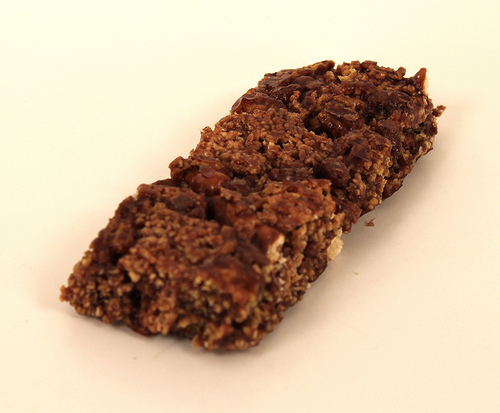 The Kellogg’s Special K Pretzel Granola bar is much better and it looks good. I truly am tired of “good looking” granola bars that taste like paste. Looks like the grocery bag may have sat in your car too long! Chocolate is chocolate, id eat it.